At face value, one might easily dismiss The Host as your run-of-the-mill monster movie, all CGI and jumpy camera shocks. I hope that doesn't happen to this film, because it’s so much more. Most of the immediate attention will be on the monster itself. Director Bong Joon-ho seems to be fully aware that people might be expecting a cheesy looking creature to go with the tried and true 50’s Sci-Fi monster movie plot: Man’s carelessness brings about a terrible end, in this case, the terrible end manifesting itself in a giant mutated sea monster. The Host’s Creature is simultaneously cheesy and fabulous. It’s a great galumphing hulk of slimy sea flesh and tentacles. It lumbers like a fast moving elephant on land, speeds underwater through the River Han, and most unexpectedly, uses its tentacles to flip and twist like a gymnast through the beams of the river bridges. The Creature is brilliantly rendered by a partnership at the good folks at the WETA Workshop (Lord of the Rings, King Kong) and The Orphanage (Harry Potter and the Goblet of Fire, Sin City). It would be remiss of me to fail to mention another Asian cautionary tale very similar to The Host. There will definitely be comparisons to Godzilla in the presence of the giant monster from the sea born of man’s disregard for nature (1954 – nuclear bombs, 2006 - chemical waste dumped into local rivers). The Host’s monster itself even resembles Hedorah from 1971’s “Godzilla vs. the Smog Monster”, and both originate from toxic pollution. The difference between the Godzilla films and The Host is that the centerpiece of the Godzilla movies was always the giant reptile himself, while with The Host the real focus is much smaller and more intimate. 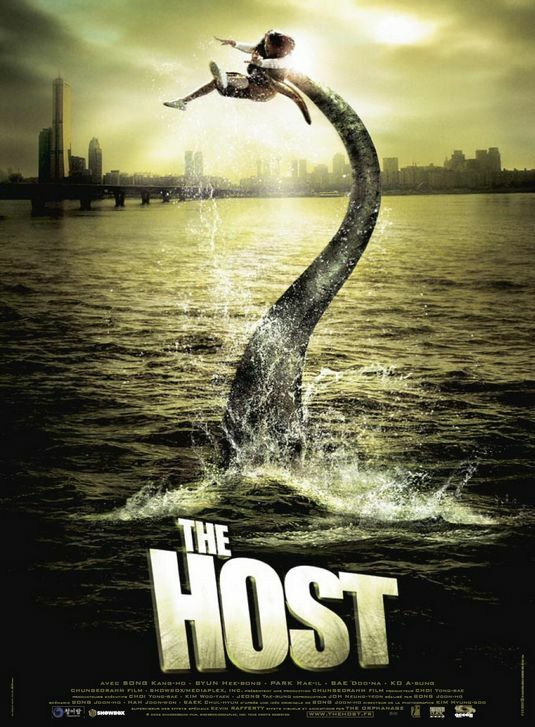 It was surprising to see that the real motivation of The Host doesn't seem to be in making a really scary monster movie, but to show how a sudden and unexpected disaster brings a scattered and dysfunctional family together. The heart of the story is the Park family, and the relationship of the slow and unambitious Gang-du (played by Song Kang-ho), and his sweet, smart young daughter, Hyun-seo (played by Ko A-sung). They run the food shop belonging to Gang-du’s father on the banks of the Han River. 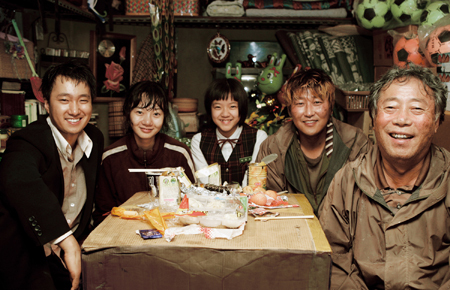 The sudden appearance of the Creature and it’s destruction in their lives unites the family, including explosive younger brother, Nam-il (played by Park Hae-il), and younger sister, archery champ, Nam-joo (played by the brilliant Bae Doo-na, late of "Linda Linda Linda" fame). Their sibling rivalries and petty squabbling in the face of imminent danger is often hilarious, and in the end quite touching. The arrival of the Creature and its handling by the media and the government makes for a very wry comment by Director Bong Joon-ho. The Park family is all alone in their anguish, unable to get any help from anyone in authority. The bureaucracy obfuscates and mishandles the disaster, creating false distractions for the public in order to cover up for their cluelessness; even going so far as to lobotomise a main character to seem as if they are proactively fighting a made-up side effect of the monster’s appearance. My only complaint would be that The Host drags a bit in the second act (-were two trips to the hospital really necessary? ), and in the moments leading up to the big showdown with the Creature. The movie’s just a minute under two hours. Other than that, I had a great time at this movie. I am a huge fan of the Godzilla films, and I believe The Host rates most favourably in the monster movie pantheon. The performances are great. I was happy to see Song Kang-ho from “Sympathy for Mr. Vengeance”; his portrayal of the slightly addled, but devoted father is both funny and touching. Ko A-sung, as the young daughter has got my vote as best new action star; her Hyun-seo is brave, strong, and smart as a whip and you care about what happens to her. You'll be on the edge of your seat watching the action sequences involving the Creature, you'll laugh out loud at the gallows humour of some of the things that befall the unfortunate Park family, and you'll feel warmed by the way they pull together, but that seems to be the exact reaction Director Bong Joon-ho is going for. This movie is one heck of a trip and a great good time.